Where are the Product Categories on my mobile device? When using a mobile device the product categories may not be visible. Step 1. Click the Menu Icon. The Menu Icon is the green box with three horizontal lines. Step 2. Click the "+" sign ( "plus" sign ) to display the product categories. See image here - opens in new window. Step 1. Click "forgot your password" link at the Authentication screen. Step 2. At the "FORGOT YOUR PASSWORD" screen - Enter your email and click "Retrieve Password >". Step 3. Check your email. Step 4. Click the link in your email ( To confirm this action, please use the following link..... ). Step 5. At the web-site you'll see the message: "Your password has been successfully reset and a confirmation has been sent to your email address:". Step 6. Check your email AGAIN. Step 7. Your new password will be in your email. Step 8. Return to the Authentication screen and using your email address and new password - SIGN IN. PayPal says: "The merchant requires a US billing address for all purchases made using PayPal." This is just an Informational Message from PayPal and is NOT an Error Message. If your address is a US address, you should not have a problem using PayPal. How do I use a voucher / coupon? At the SHOPPING-CART SUMMARY you'll see VOUCHERS / COUPONS in the lower left. Click OK - You will not get a discount until you click OK. The Discount Amount will be displayed in your shopping cart. Yes, if you use INSTANT CHECKOUT enter the DELIVERY ADDRESS and click the check box “Please use another address for invoice” to enter your INVOICE ADDRESS. During the checkout process at step “03. 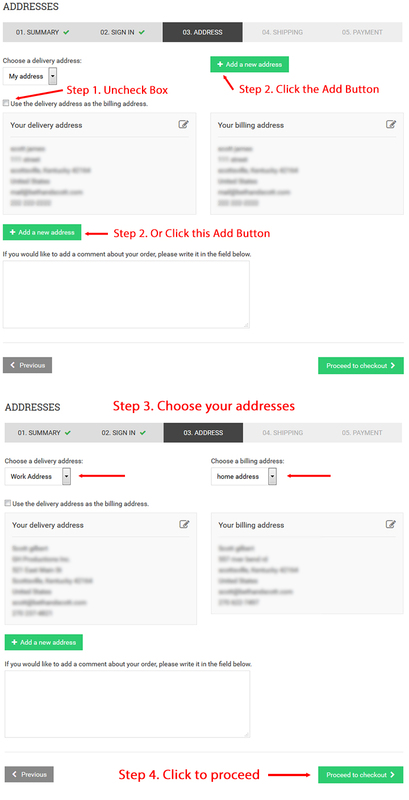 ADDRESS” - Uncheck the box next to: " Use the delivery address as the billing address. " Click the "+ Add a new address" button and enter the new address. At the bottom of the page assign an 'address title' for future reference, such as “Home Address” or “Work Address”. Save the information and you will be taken back to the “03. ADDRESS” page. Using the pull down menus you may now Choose a delivery address and you may Choose a billing address. NOTE: You may enter as many addresses as you need. These addresses are saved so you may use them in the future. We do ship basket making and chair caning supplies to Canada and to some countries overseas. The shipping charges at checkout will show $50.00 BUT, after you checkout; we will let you know the real shipping charges via email. Your card will not be charged and your order will not be shipped until we have your approval. You will be responsible to the Postal Service for Customs charges. How do I lookup or change my account info? Enter your email address in the NEWSLETTER box at the lower left. We use Mailer Mailer to send the Basket Maker's Catalog eNewsletter. You may unsubscribe at anytime. I am having problems at checkout. I keep being sent back to the shopping cart. It's probably the old Mac computers running Safari. Users should upgrade their Operating System and Web Browser when having this issue. The old operating systems/browsers will try to use SSL ( secure socket layer ) for the HTTPS ( secure transfer ) protocol. Thanks to Poodle and Heartbleed viruses, nobody is allowed to use SSL anymore in favor of the new TLS ( Transport Layer Security ). So some old operating systems will not let the user checkout. Add The Basket Maker's Catalog to the Home page of your Smartphone or Tablet.